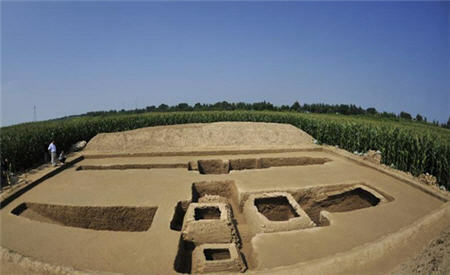 An archaeological excavation of ancient tombs has been completed in Huanghua city, Hebei province, on Aug 26, 2015.Dated back to the Eastern Han Dynasty (AD 25-220), the tombs were discovered by farmers in March 2014; the institute began its excavation on July 28. There are two tombs positioned next to each other, in an east-west direction, and they have multiple chambers. Exquisite examples of decorative bricks have been discovered at the dig site. Bricks feature rhomboid patterns, carriages and horses, dragons and clouds, said Lei Jianhong, a researcher with the Hebei Provincial Cultural Relics Research Institute. However, the tombs were pillaged by grave robbers and the west tomb is severely damaged. Still, more than 20 pieces of pottery have been found in the tombs.